Trichodesmium. It’s the bacteria that’s solely responsible for the fixation of nearly 50 percent of nitrogen in the world’s oceans. A very important role for this microscopic critter. For without nitrogen fixation — or the process by which environmental nitrogen is converted to forms usable by organisms — most of life on Earth would not exist. Now, a new study produced by USC and the Massachusetts-based Woods Hole Oceanographic Institution (WHOI), has found that human carbon emissions are set to drive this essential organism haywire. Forcing evolutionary changes in which the bacteria is unable to regulate its growth. Thus generating population explosions and die-offs that will be very disruptive to the fragile web of life in the world’s oceans. Trichodesmium is a form of cyanobacteria. It resides in the near surface zone composing the top 200 meters of the water column. Possessing gas vacuoles, the bacteria is able to float and sink through the water column in order to access the nutrients it needs for growth — nitrogen, iron, and phosphorus. A widespread bacteria, it is often found in warm (20 to 34 C), nutrient-poor waters in the Red Sea, the Indian Ocean, the North and South Atlantic, the Caribbean, near Australia, and in the Northeastern Pacific. Trichodesmium congregates in blooms which are generally a straw-like color. For centuries, this coloration has generated its common name — sea straw. However, in higher concentrations it can turn waters red. The Red Sea, for example, owes its name to this prolific little bacteria. 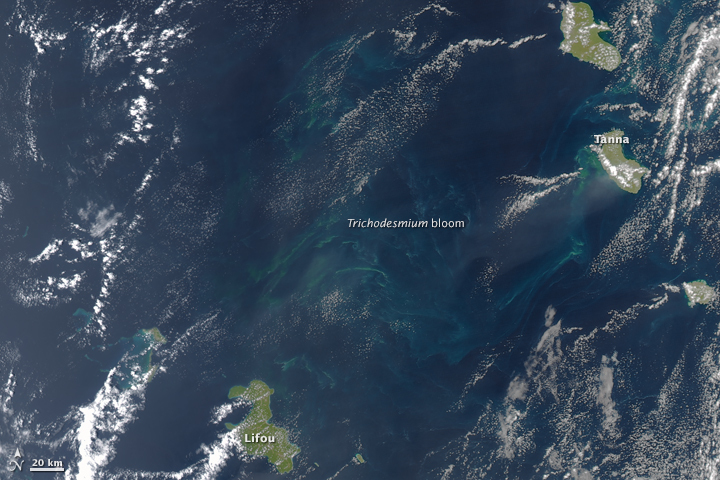 Trichodesmium blooms generate a strata that support mutualistic communities of sea creatures including bacteria, diatoms, dinoflagellates, protozoa, and copepods. These small organisms, in turn, are fed on by a variety of fish — notably herring and sardines. But Trichodesmium’s chief role in supporting ocean health is through making nitrogen in the air and water available to living organisms. It does this by turning environmental nitrogen into ammonia as part of its cellular metabolism. This ammonia can then be used for growth by a wide variety of creatures on up the food chain. Trichodesmium is an amazing producer of this biologically available nitrogen — perhaps generating as much as 50 percent of organic nitrogen in the world’s oceans (70 to 80 million metric tons) each year. But now a new study by USC and WHOI shows that atmospheric CO2 concentrations projected to be reached by the end of the 21st Century in the range of 750 ppm CO2 could force Trichodesmium’s nitrogen fixation rate into overdrive and lock it there indefinitely. The study subjected Trichodesmium to atmospheric CO2 concentrations (750 ppm) projected under a somewhat moderate rate of continued fossil fuel burning scenario by 2100 for five years. After this five year period of exposure, Trichodesmium nitrogen fixation rates nearly doubled (see above graphic). But, even worse, after the Trichodesmium bacteria were returned to the more normal ocean and atmospheric conditions under 380 ppm CO2, the rate of nitrogen fixation remained elevated. In essence, researchers found that Trichodesmium evolved to fix nitrogen more rapidly under higher ocean acidity and atmospheric CO2 states at 750 ppm levels. But when atmospheric levels returned to 380 ppm and when oceans became less acidic, Trichodesmium’s rate of nitrogen fixation remained locked in high gear. For an organism like Trichodesmium to get stuck in a broken rate of higher metabolism and growth is practically unheard of in evolutionary biology. Organisms typically evolve as a response to environmental stresses. 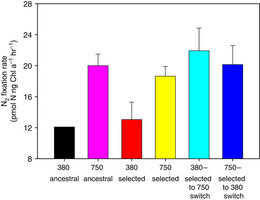 Once those triggers are removed, organisms will typically revert to a near match of previous states. Strangely, this was not the case with Trichodesmium. Nitrogen is a key component of cellar growth. So Trichodesmium nearly doubling its rate of nitrogen fixation means that the bacteria’s rate of production will greatly increase as atmospheric CO2 levels and ocean acidification continue to rise. Under heightened CO2, the bacteria essentially loses its ability to restrain its population. As a result, researchers warn that Trichodesmium blooms may run out of control under heightening levels of CO2. Such out of control blooms would rapidly remove scarcer nutrients like phosphorous and iron from the water column. Once these resources are exhausted, Trichodesmium would begin to die off en-masse. As with other large scale bacterial die-offs in the ocean, the decaying dead cellular bodies of Trichodesmium would then rob the nearby waters of oxygen — greatly enhancing an already much amplified rate of anoxic dead zone formation. And we know that anoxic waters can rapidly become home to other, far more dangerous, forms of bacterial life. In addition, large concentrations of Trichodesmium are known to produce biotoxins deadly to copepods, fish, and oysters. Humans are also rarely impacted suffering from an often fatal toxicity response called clupeotoxism when the Trichodesmium produced toxins biomagnify in fish that humans eat. Sadly, more large Trichodesium blooms will enhance opportunities for clupeotoxism to appear in human beings. Exacerbating this problem of heightened Trichodesmium blooms and potential related dead zone formation is the fact that ocean waters are expected to become more stratified as human-forced warming continues. As a result, more of the nutrients that Trichodesmium relies upon will be forced into a thinner layer near the surface — thus heightening the process of bloom, die-off, and dead zone formation. Final impacts to ocean health come in the form of either widely available nitrogen, (during Trichodesmium bloom periods) which would tend to enhance the proliferation of other microbial life, or regions of nitrogen desertification (during Trichodesmium die-offs). It’s a kind of ocean nitrogen whip-lash that can be very harmful to the health of life in the seas. One that could easily ripple over to land life as well. But perhaps the most shocking finding of the new research was that alterations in Trichodesmium’s rate of growth and nitrogen fixation may well be permanent after the stress of high CO2 and ocean acidification are removed. Hinting that impacts to ocean health from a rapid CO2 spike would be long-lasting and irreparable over anything but very long time-scales. Yet more evidence that the best thing to do is to avoid a major CO2 spike altogether by cutting human carbon emissions to zero as swiftly as possible. Enormous blooms of algae painting the waters green, sickly blue, or blood-red. Algae producing toxins making water unsafe to drink or swim in. Making fish, shellfish and crabs unsafe to eat. Generating life-snuffing dead zones of low oxygen and, potentially, producing deadly hydrogen sulfide gas ranging our lakes, seas, and oceans. This is what happens when the world is forced to warm, when run-off due to climate change induced extreme rainfall events increases, when the land that run-off comes from is loaded with fossil fuel based fertilizers, and when fossil fuel burning itself generates a constant fall-out of nitrogen from the skies. In ancient hothouse events, similar forces generated mass extinctions in the world’s waters. And through fossil fuel burning we’re setting off a related hothouse type stress to the life-giving liquid we all rely upon. A stress that is yet worsened due to the efficiency with which we are able to load the air, land, and seas with environmental toxins that aid in the generation of algae blooms of an intensity nature alone would have never kicked off. In the US, one of the most vulnerable bodies of fresh water to this kind of toxic algae growth is Lake Erie. Over recent decades as the local climate changed, the water warmed. Weather patterns resulted in increased heavy rainfall events. Increased farm industry and fertilizer use meant that much of the run-off was heavily laden with algae food. And the atmosphere itself became loaded up with nitrogen. In addition, the lake is more vulnerable to a life-snuffing stratified state in which the top and bottom layers fail to mix. A final blow came from an invasive species of mollusk — the zebra mussel — which changed the food web in such a way that it favored the growth of the toxic algae we see today. All these factors combined to make the surface waters more and more vulnerable to large, toxic algae blooms and the follow-on formation of dead zones. Since the mid 1960s, late summer algae blooms have been a regular occurrence on the lake. But more and more now, the blooms are prolific enough to threaten city water draws. The bloom will be expected to measure 8.7 on the severity index with a range from 8.1 to potentially as high as 9.5. This is more severe than the last year’s 6.5, and may equal or exceed 2013, which had the second worse bloom in this century. The severity index runs from a high of 10, which corresponds to the 2011 bloom, the worst ever observed, to zero. A huge swath of the western end of the lake was covered with the stuff as of August 5, 2015. A clearly visible green blob blanketing much of Erie’s western surface. Researchers out on boats monitoring this year’s outbreak described the lake as being painted in a thick sheen of goop. 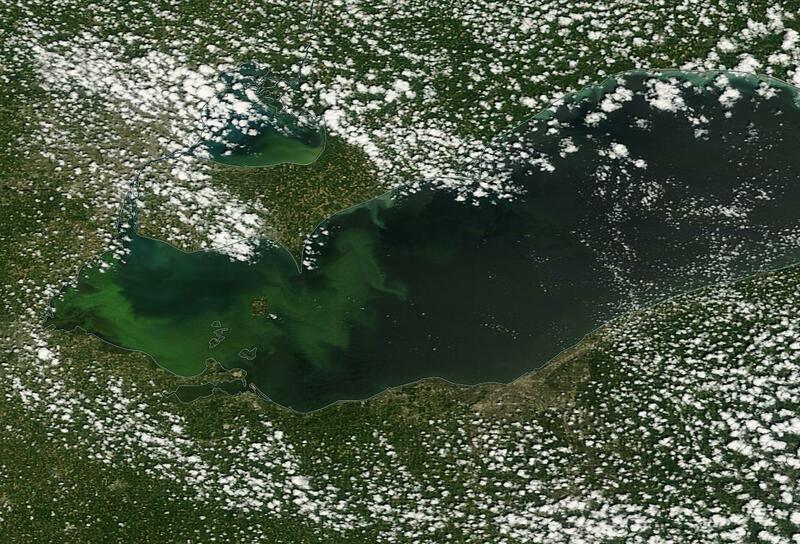 According to NASA, the particular kind of algae that now appears annually in Lake Eerie is called Microcystis. It produces a toxin that is highly dangerous to humans. If consumed, Microcystis may cause numbness, nausea, dizziness, vomiting, lead to liver damage and even result in death. One part per billion in water is all it takes to hit unsafe levels. And boiling toxin-laced water is no remedy — resulting in further concentration of the dangerous stuff. During August of 2014, unsafe levels were reached at Toledo intakes causing water officials to shut down the lake water supply there. This year, officials are closely monitoring the water supply ready to hit the off switch if the water again hits a dangerous threshold. 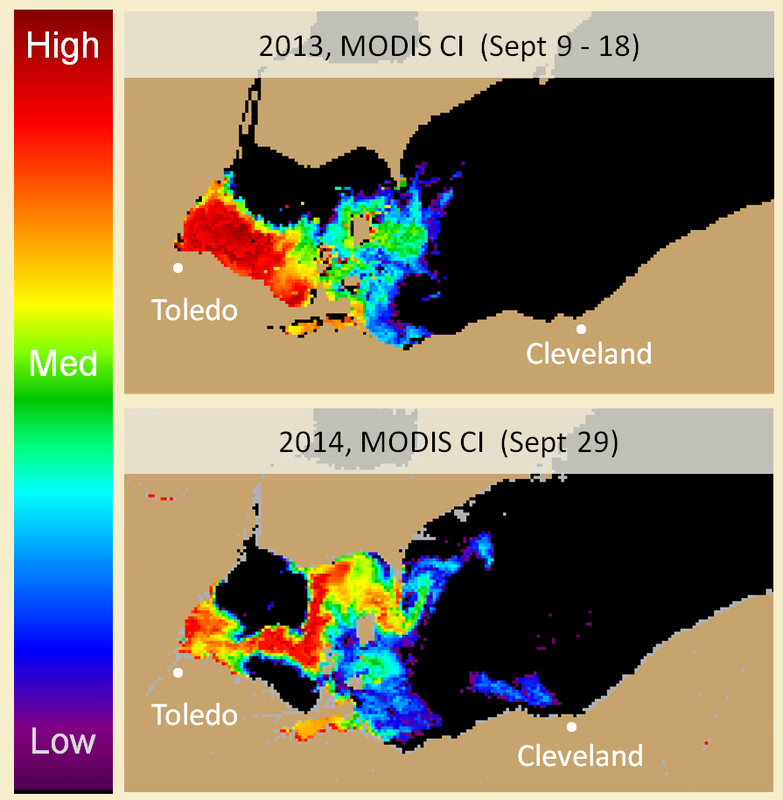 Sadly, Lake Erie isn’t the only place on Earth suffering the impacts of hothouse-spurred toxic algae blooms. 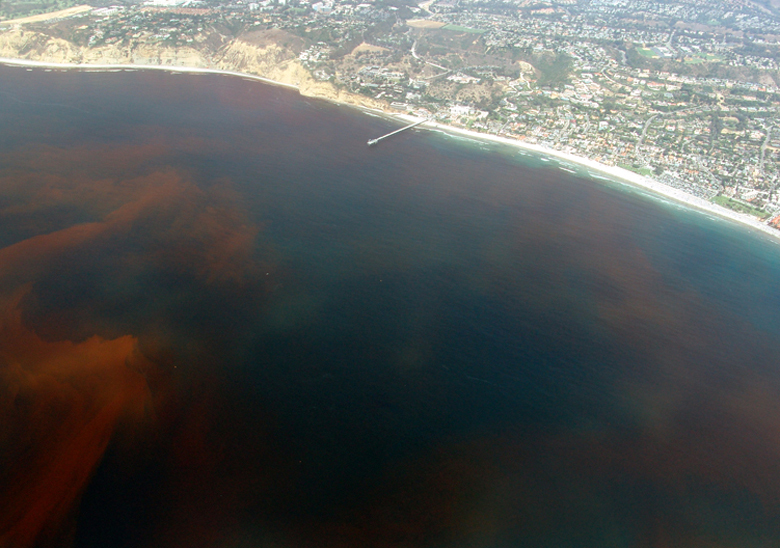 In the Pacific Ocean, a massive blob of hot water is hosting a red tide of record depth and extent. That particular bloom risks the expansion of an already large dead zone, the proliferation of anoxic and hypoxic waters, and the potential for bottom water production of toxic hydrogen sulfide producing bacteria. In the North Atlantic, swirls of algae blooms are generating mobile dead zones even as the far North Atlantic is witnessing a massive blue-green algae bloom (more on these dangerous human warming related events in upcoming posts). In the 1930s, pulp horror writer H.P. Lovecraft penned tales of ancient monsters called Old Ones that, if awakened, would emerge to devour the world. One of these horrors, Cthulu, lay in death’s sleep in his house called R’lyeh at the bottom of the Baltic Sea (Charles Stross) awaiting some impetus to disturb him from necrotic slumber (ironically, the Baltic sea bed contains one of the world’s highest concentrations of the deadly hydrogen-sulfide producing bacteria that are a focus of this article). In the imaginary world of H.P. Lovecraft, terrible lore of these horrific Old Ones, among which, Cthulu was the worst, lay stored in ancient tomes. To learn of these mysteries was to risk madness. For the Old Ones were too awful for the human mind to conceive without succumbing to a hopeless darkness. In researching the terrors that could emerge in a world destabilized by human warming, I am often reminded that human imagination is not without a sense of dramatic irony. But in this case, the irony invoked is that human imagining, in fiction, seems to sometimes possess a broader perception of potential real world risks and their implications for human thought, than the far more defined warning signal coming from the sciences. Cthulu, in this case, may as well be a metaphor for one of the worst of the world’s ancient climate horrors — the oceanic production of hydrogen sulfide gas that occurred from time to time, during various hothouse events. A production implicated in many of the worst mass extinction events ever to mar the history of life on Earth. In understanding this ancient horror, we must first take a look at some of the world’s oldest and smallest creatures. 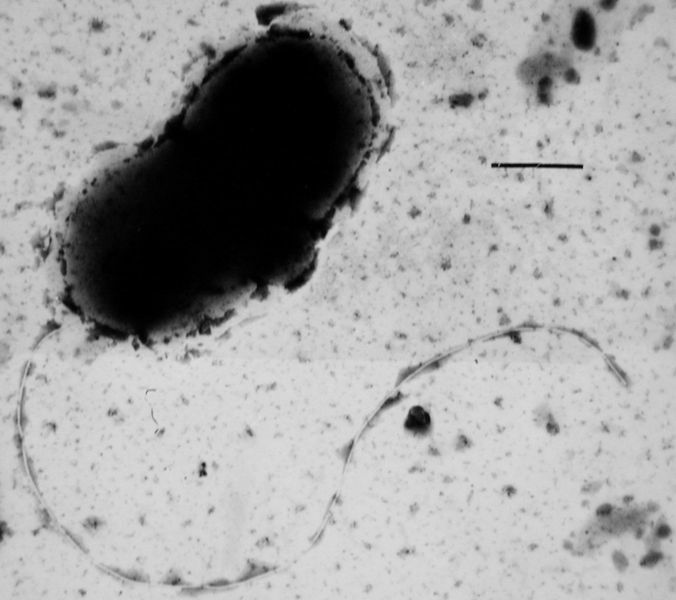 Primordial bacteria. About 3.5 billion years ago, the Earth was a hot, toxic place, bombarded by solar radiation. It was still cooling down after its initial formation. The oceans had spilled out over its surface, but the continents had yet to emerge. Atmospheric levels of CO2 were high and oxygen was virtually nonexistent. But, in this world, small microbial organisms thrived. Deprived of oxygen, which is the now typical means of respiration for non plant organisms, the microbes required other sources for their simple cellular metabolism. Sulphate was common in the world’s emerging oceans and reacted well with hydrogen, which was also very common. The result was the emergence of some of the oldest known living organisms — the sulphate reducing bacteria. Suphate reducing bacteria combined sulphate and hydrogen to produce hydrogen sulfide gas or H2S. As a result, ancient oceans were cauldrons bubbling over with hydrogen sulfide which was the biproduct of these primordial organisms’ respiration in much the same way that oxygen is a biproduct of plant respiration and CO2 is a biproduct of animal respiration. Such an ocean state, called a Canfield Ocean by today’s scientists, was the common state for the world’s oceans until the emergence of more complex life around 2.5 billion years ago. By about 600 million years ago, the Canfield Ocean state only very rarely came into being and when it did, mass death tended to rapidly follow. As the Earth system matured and new organisms came into being, CO2 reducing photosynthetic life emerged and began to produce an abundance of oxygen. Toxic to the ancient organisms, the abundance of oxygen pushed the sulphate reducing bacteria into the world’s low-oxygen corners. The deep ocean, or anaerobic mud became a haven for these tiny primordial monsters. Never again would they dominate as they once did. But, from time to time, when priomordial ocean states would infrequently emerge during various hot-house phases in Earth’s climate progression, these life forms would explode, producing prodigious volumes of what, to more complex life, was the very toxic hydrogen sulfide gas. Hydrogen sulfide is directly toxic to most plant and animal based life. Its effects in animals are similar to that of hydrogen cyanide in that it eventually results in cardio-pulminary shock and then death. Lower levels of hydrogen sulfide are associated with loss of smell, blindness, respiratory infections, and loss of neurological and nervous system function. At very low levels, hydrogen sulfide is non toxic and is even produced in cells to perform various functions. Human lethality begins at around 600 parts per million. Smaller mammals with higher respiration rates begin to show lethality at around 450 ppm. Doses in the range of 10-20 parts per million have been known to cause eye irritation and damage over long periods of exposure. Levels over 50 ppm are generally considered harmful if exposure occurs for long durations. Doses between the irritation dose (10 ppm) and the lethality dose (600 ppm) over extended periods are shown to cause the eye damage and degenerative nerve and lung changes listed above. In the environment, hydrogen sulfide causes numerous other damaging impacts. The gas reacts with hydroxyl and oxygen over the course of about 1 to 3 days to produce sulfur dioxide. Aside from providing a mechanism to draw down local oxygen levels, the sulfur dioxide product can end in the stratosphere where it substantially degrades the protective ozone layer. Though hydrogen sulfide is slightly heavier than air, tending to pool at lower elevations, it is light enough to be born aloft by winds to various layers of the atmosphere and its even lighter sulfur dioxide products are quite a bit more mobile. At high enough atmospheric concentrations, both it and its sulfur products could begin to seriously degrade the Earth’s protective ozone layer. And evidence exists in the geological record of such events occurring on at least a couple of occasions during the last 250 million years. Notably, during the Permian extinction event, large numbers of fossils have been found with the characteristic UV damage that would occur in a world in which the ozone layer had been greatly degraded. At high enough concentrations, hydrogen sulfide is volatile enough to burn. A 4.3 percent concentration is immediately combustible, producing a bluish flame. This extraordinarily high concentration would be almost immediately lethal to humans if inhaled and usually only presents a fire risk at highly concentrated sources. In the current day, high concentrations of hydrogen sulfide gas are often associated with natural gas extraction. Natural gas, by volume, can contain as much as 90 percent hydrogen sulfide. The hydrogen sulfide, in this case, occurs due to catalytic reaction of the hydrocarbon with certain minerals present in the Earth. Though not produced by the same mechanisms as oceanic hydrogen sulfide, the gas in this form is just as dangerous and is a constant concern to workers of the oil and gas industry. Notably, risks of hydrogen sulfide exposure, leaks, and release into the environment have greatly increased with the widespread adoption of hydro-fracking practices that use high pressure liquids to rupture tight gas deposits and chaotically release the substance for its collection at one of the US’s 1 million well sites. In general, the volatility, danger, and toxicity of the gas is difficult to overestimate. Notably, its lethality resulted in its use as a chemical weapon during World War I. High concentrations of hydrogen sulfide, resulting both from its production in a Canfield type ocean state and, possibly, through its release in large methane pulses from the sea bed during catastrophic warming events, has been implicated in numerous mass extinction events both on land and in the ocean. Notably, the Permian-Triassic extinction, the Triassic-Jurassic extinction, and the PETM extinction in the deep oceans all show signs related to ocean anoxia and varying levels of hydrogen sulfide gas production. Earlier mass extinctions such as the Devonian and Ordovician extinctions were also likely caused by anoxia and related hydrogen sulfide production. Lesser extinctions in which ocean anoxia also probably played a part include the Ireviken, Mulde, Lau, Toarcian and Cenomanian-Turonian events. Prominent researchers such as Ward and Kump propose that hydrogen sulfide production by sulfate reducing bacteria is a primary extinction mechanism in stratified and anoxic oceans due to their inevitable multiplication in these environments which are, to them, far more favorable than oxygen-rich mixed oceans. In a Canfield Ocean world, large, episodic releases of hydrogen sulfide gas would cause local mass poisonings of land dwelling animals, especially of those living near large ocean-linked bodies of water. The ocean itself would be brimming full and spilling over with this nasty substance. This condition would be highly toxic to most life, requiring extreme adaptation to survive in naturally occurring havens. Separate depletion of atmospheric oxygen through both the plant killing mechanism of hydrogen sulfide gas and its long-term reaction with oxygen would also make life far more difficult to terrestrial creatures. Finally, the massive amounts of sulfur dioxide produced in such a world would combine with the hydrogen sulfide pulsing into the atmosphere to create an ongoing, long-term degradation of the ozone layer, further harming surface dwelling plants and animals. During the Permian Extinction, such conditions, together with other impacts of a global hothouse featuring a massive flood basalt, are thought to have wiped out more than 70% of terrestrial organisms and a total of more than 95% of all life on Earth. The world’s oceans, according to recent research, are rapidly becoming more stratified and less oxygen-rich. The result is that mixing between various layers of the ocean is beginning to shut down reducing oxygen content in the deep ocean and spurring the expansion of numerous oceanic dead zones. Over the past 150 years, the Pacific Ocean was observed to become more stratified at a pace ten times that seen during the end of the last ice age about 12,000 years ago. Such a rapid pace of stratification is putting severe stress on the world’s oceans with numerous regions showing the effects of low oxygen (hypoxia) and some regions succumbing to increasingly anoxic states. These low oxygen events have been associated with multiplying oceanic dead zones. Very large dead zones have been observed in the Pacific, specifically off the coast of Oregon. Other major dead zones continue to be observed at the mouth of major river systems, such as within the Gulf of Mexico, where the appearance of massive related toxic algae blooms is now an almost annual event. In general, almost all ocean dead zones are expanding leading to the dramatic reduction in habitat size of numerous fish species. And even the most cursory research provides ample evidence that ocean hypoxia is expanding concurrently with a rapidly expanding ocean stratification. When combined with the jarring effects of rapid ocean warming and expanding acidification, it becomes plainly obvious to almost any ocean ecologist that the world’s ocean system is suffering the heavy bombardment of a new mass extinction event. It is this kind of low or no oxygen environment that is a prime breeding ground for hydrogen sulfide producing bacteria. In numerous places around the world, such as off the coast of Namibia, in the Black Sea, in the Baltic Sea, in the Gulf of Mexico, in the Chesapeake Bay, and off the coast of Oregon, large and expanding zones of hydrogen sulfide have been observed in deep water environments. In some regions, this hydrogen sulfide occasionally penetrates to the surface layer resulting in major fish kills and a concordant rotten egg smell. Off the Oregon coast, in perhaps one of the most extreme examples of ongoing ocean hypoxia, one of the world’s largest and most oxygen-starved dead zones continues to expand. The oxygen levels in this region are so low that local fisherman often bring back horrific tales of baby bottom dwelling creatures such as crabs and octopus climbing anchor ropes to escape the dangers of their oxygen-starved environment. In another, possibly related event, masses of starfish perished during 2013 and 2014 as they, over the course of a few weeks, turned to goo. The fact that this sci-fi esque mass death of starfish occurred near one of the world’s largest dead zones should not be lost on those concerned for world ocean health. But perhaps even more concerning is the fact that this region off the Oregon coast is producing substantial volumes of hydrogen sulfide gas. Volumes high enough in concentration to occasionally cross the ocean-air boundary. Oregon possesses numerous features that would aid in the transport of this gas to the surface. Primarily, the near Oregon ocean system frequently features strong up-welling currents. These currents can push bottom waters through stratified layers and cause them to contact the surface. If these oxygen starved bottom waters contain hydrogen sulfide gas, as they increasingly do, this harmful gas can be transported into the local atmosphere through mixing. Such events, thus far, have been limited. However, since the Oregon dead zone’s discovery in 2001, its expansion has been both deeply concerning and well documented, showing a rapid and dangerous growth over the 13 years since its emergence. 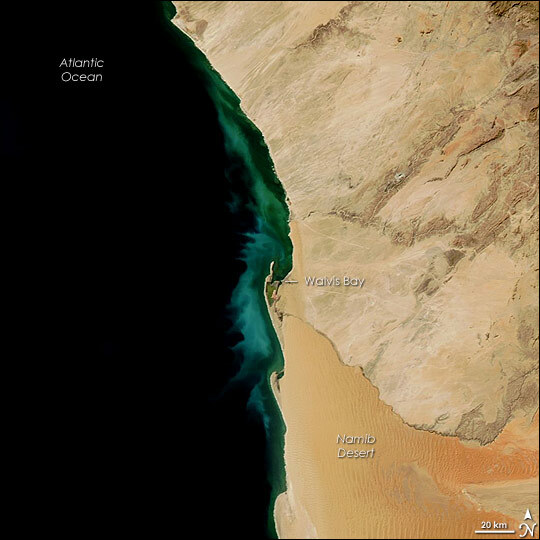 Despite the documented expansion of deep water hydrogen sulfide in numerous oceanic regions, the only other ocean zone on Earth observed to emit hydrogen sulfide gas to the atmosphere is in the region of coastal Namibia. In Namibia, huge volumes of organic compounds fall into the sea after being flushed down ocean terminating streams and rivers. These organic compounds rain down into the deep ocean directly off Nambia’s coasts. There, the ocean bottom hosts both an anoxic environment and masses of hydrogen sulfide producing bacteria. As a result, toxic hydrogen sulfide gas periodically erupts from the ocean and into the atmosphere there. There are few limiters to oceanic hydrogen sulfide production in the world’s increasingly stratified and oxygen starved oceans. Sulphate, which the bacteria require for respiration, is one of the most common ocean elements. In the current ocean, it is present in volumes greater than those seen during the Permian Extinction when these tiny monsters are thought to have done their worst. Iron and manganese in the world ocean system aids in the development of less permeable boundary layers that help keep a lid on deep ocean concentrations of hydrogen sulfide. However, even in the anemic circulation of stratified and Canfield oceans, upwelling will bring the gas to the surface in certain regions. In addition, as the oceans contain greater and greater volumes of the toxic gas, it will push closer and closer to the surface, rendering metals that help reinforce the boundary layer a practically useless prophylactic (such high metal concentrations currently prevent hydrogen sulfide from penetrating the surface layer in the Black and Baltic Seas as well as in the Chesapeake Bay). In addition, modern industrial farming practices provide extra nutrients upon which these dangerous microbes can feed. High levels of hydrogen sulfide in the deeper regions of the Chesapeake Bay, for example, owes its existence, in part, to massive farm run-off into the Bay and the dumping of mass volumes of nutrients upon which the sulphate reducing bacteria can feed. It is important to note that we observe heightened levels of hydrogen sulfide gas in the world ocean system now. As hypoxia and anoxia progress with the human-caused warming of the oceans, and as glacial melt interrupts and alters the now strong ocean currents and related mixing, it is certain that hydrogen sulfide production in the deep ocean will continue to increase resulting in elevating levels of harm to ocean dwelling animals and ever more numerous instances of hydrogen sulfide gas contact with coastal and surface waters. In the context of increasing ocean hypoxia and stratification, we might do well to remember that we are tiny, weak beings at the mercy of great natural forces which we can barely conceive or understand. Forces that we have unwittingly, callously and ignorantly set into motion. Long ago, when I was a ten year old child, I was fortunate enough to meet an amazingly kind, adventurous and inquisitive man. The man, whom I will call Rick to keep safe his identity, was a bit of a local paramour in ocean and bay research. He was constantly in contact with both the ocean and adjacent Chesapeake bays, ever venturing out to explore and to conduct research on marine life. In later years, he would be the impetus behind annual summer marine science camps hosted by the Virginia Institutes of Marine Science, Norfolk Academy, and Old Dominion University. But this was later. Now, Rick was helping an elementary school student present on the issue of our then expanding understanding of marine science. Living so close to the bay and ocean, I was intimately in contact with the living boundary of land and sea. In the more demanding and less stimulating forum that was public education, I seldom had the opportunity to indulge my passion for the oceans. But at age 10 I was given the opportunity to give a broad marine science presentation for my classmates. As part of my project, I constructed posters and models depicting the current state of world ocean research. I graphically illustrated the various known zones of the bathysphere, the light and life filled ones and the more mysterious and far less well understood depths. But Rick was the centerpiece of my presentation. He was my keynote. And he energetically answered all my own and fellow students’ questions, speaking in the kind and intriguing manner that would later draw so many into his charismatic orbit. In later years, I would attend Rick’s summer marine science camps on two different occasions. In both cases, I observed what appeared to be an increasing concern about both the health of the Chesapeake Bay and the neighboring oceans. In later years, Rick’s attitude, once so full of optimism, bordered on cynicism. 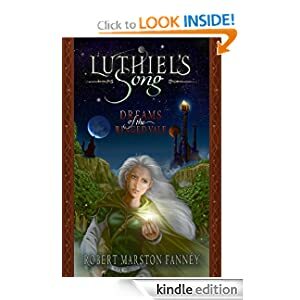 The world he loved so deeply was experiencing death on a scale that horrified him. 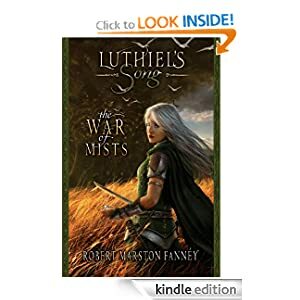 And he harbored a deep sense of betrayal that we weren’t doing more to stop the senseless slaughter of so many of the living things he saw as both beautiful and wondrous. In the mid 2000s, Rick committed suicide. To me, one of the great ocean pioneers of my developmental years had passed away by taking his own life. And I couldn’t help but wonder if the horrible ways in which the oceans that he so loved were changing was just too much for him. If the commercialization and cheapening of all the things he held most dear along with their subsequent damaging and putting at great risk of terrible harm had robbed his life of beauty and purpose. Rick was, if anything, a very intelligent and sensitive man. He knew what was happening to the Bay and ocean on a personal level. When the Bay was harmed it was as if it hurt Rick too. Rick also knew how temperature changes affected the depths. For he was on the front line studying it. He was hauling up the fish and the water samples. He was doing the measuring with his own hands. Was the awakening of terrible Cthulu, in the form of hypoxia, anoxia and deadly hydrogen sulfide producing bacteria, too much for Rick to continue bearing mute witness? Did his pleas to those working in the marine science community fall only on deaf ears? Was it just too much for this sensitive, feeling, and intelligent man to bear? If Rick taught me anything it was that our lives and the life of the ocean are deeply connected. One cannot remain healthy without the other. In contrast to this basic understanding, the damage our continued industrial emission of greenhouse gasses is doing to the world ocean system is a horrific travesty. And the damage we have already caused, have already done to those most sensitive creatures among us, have already set in play for future decades and centuries, is tremendous. The ocean suffocates, bleeding deadly hydrogen sulfide gas. Cthulu rises from his ancient house in the depths. And yet we still continue down the wretched path in pursuit of more terrible things to come.